DOWN Policing and Community Safety Partnership (PCSP) along with the Newcastle neighbourhood policing team have come together to launch a community safety initiative called ICE (In Case of Emergency). ICE aims to encourage members of the public to keep their emergency contact details close at hand. Newcastle Neighbourhood Police Sergeant Jimmy McIlveen, Constable Karen Revels-Ward and Councillor Willlie Clarke, PCSP Chairman, launch the ICE initiative. 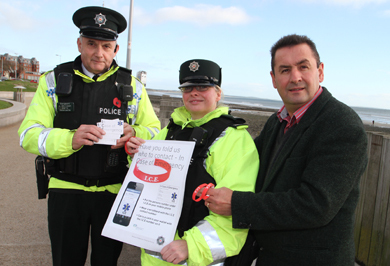 “The initiative will see 1000 customised ICE rubber wristbands handed out in the Newcastle area. The popular bands have a window on the inside into which ICE contact details or details of any medical conditions and allergies can be entered. “Wearing the wristband means that should an individual find themselves in an emergency and require assistance, the emergency services can quickly and easily find the details they need to contact family or administer the right treatment. Newcastle neighbourhood officers will be distributing the wristbands and cards in local pubs as part of the ‘Get Home Safe’ programme, as well as in local youth clubs and groups for vulnerable people.